Combo comes with 50 lbs. 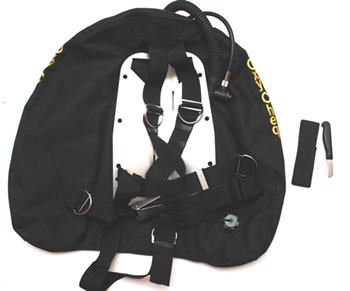 Oxycheq Doubles wing, SS backplate with harness and FREE harness knife. Oxycheq double cylinder wings are made with less buoyancy at the top and more at the bottom of the wing where it is needed. This is achieved by having a narrower and longer shape than other wing designs. The narrow shape also results in significantly less drag ... and it is noticeable. The narrow 3" in diameter neck also allows the diver to reach their valves easier. Three pair of grommets, spaced 11" apart, allows the diver to fine tune their trim. Our "water drains" efficiently dump water and there are no flow restrictions. The heavy duty zipper has a thick sheet of rubber between the zipper and the bladder to prevent wear or pinching. The inflator elbow is adjustable allowing the diver to adjust the angle as desired. The purpose of an outer shell is to provide abrasion resistance while the inner shell is for puncture resistance. The Urethane on coated bladders are not as thick as normal Urethane bladders and that results in less puncture resistance. Oxycheq decided upon a Urethane inner bladder because this material is easily patched in comparison to nylon coated bladders as well as better puncture resistant qualities. There is a difference in quality of materials and the materials used in Oxycheq wings are made in the USA.